One of the reasons that I agreed to be part of the She Reads network is that I love women's fiction. I was hoping that I might discover some new-to-me authors as well as some wonderful books. And that's exactly what happened to me when I read CALLING ME HOME by Julie Kibler. CALLING ME HOME tells the story of an unlikely friendship between Isabelle and Dorrie and a trip that will forever change their lives. Isabelle is an 89 year old white woman who asks Dorrie, her African American hairdresser, to drive her from Texas to Ohio for a funeral. Isabelle doesn't give Dorrie much in the way of an explanation; however, Dorrie wants to help her friend despite having a few issues of her own on the home front. As these two women spend many hours in the car, Isabelle begins to open up to Dorrie about her past; and Dorrie finds that the lessons she learns about Isabelle's life have the power to make a difference in her own. When I first read the description for CALLING ME HOME I thought it sounded like one I'd enjoy. I like books that explore female friendships (as well as unlikely ones), and I also find stories with flashbacks to be very entertaining (if done well!) Having said that, I admit that I didn't enter this book with high expectations. I was afraid that the story wasn't going to be original enough -- if that makes sense. I had a feeling that I'd read a few books like this before; however, I was pleasantly surprised by how much this novel affected me. I ended up really, really liking this book. There were two main aspects of this novel that I really stood out for me. First of all, I loved the how Isabelle's and Dorrie's friendship was portrayed. Not only were these women different in both age and race, but they were also seemingly very different in personality. At the beginning of the novel, these women didn't have a close friendship -- it was more of a casual acquaintance; however, it was through their mutual sharing that this relationship grew into a special one. Furthermore, these women definitely had some issues with preconceived notions and judging each other. I loved that as their comfort level and respect towards each other grew, they learned to get past these ideas. As a result, their friendship became stronger, but they also grew as individuals. Maybe these changes weren't so much for Isabelle who was already an older women, but for Dorrie, these changes were extremely valuable and hopefully helped her to move forward with the relationships in her life. Another aspect of this novel that I really enjoyed were the flashbacks to Isabelle's life growing up in Kentucky. Isabelle fell in love with a young black man who had aspirations to be a doctor in a time and town where whites and blacks weren't allowed to marry (or even have relationships for that matter.) Through these peeks into Isabelle's life, the reader was allowed to see a softer, side to Isabelle; and honestly, my heart just broke for her. There is no doubt that Isabelle had some secrets and darkness in her past which ended up affected her the rest of her life, and I think this story reminded me that lots of people have similar baggage. One of the lessons that I learned from this novel is that I need to be more understanding and compassionate towards others. CALLING ME HOME is Ms. Kibler's debut novel and all I can say is "WOW!" I was so impressed with her writing and I loved that this story was partially inspired by her grandmother. I appreciated her character development as well as their dialogue, and I thought it all of it rang very true. In addition, she went back and forth between the present and the past stories very well (which isn't always the case) and her transitions between the two were very effective. Also, even though I did find the ending to be a bit predictable, I liked it -- and boy did it make me cry! CALLING ME HOME is perfect for book clubs and especially ones made up of women. I wasn't able to find a reader's guide, but I have no doubt that you won't need one to generate some intelligent (and emotional) discussion. Some of the themes you might want to explore include racism, injustice, love, marriage, motherhood, friendship, trust, secrecy, forgiveness, and redemption. There are also many life lessons in the pages of this book which warrant some reflection. 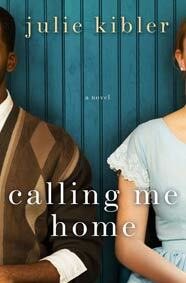 Overall, I thought CALLING ME HOME was an excellent novel and I highly recommend it to fans of women's fiction! Thanks to the publisher and She Reads for providing a review copy of this novel. Once again, I'm late to the party. I'm only getting going on this book but, so far, I'm loving it! I really loved this book too, and didn't really have ANY expectations going in. I loaned the book to my mom and she loved it too...a lot. This was a total home run in my book. I really enjoyed this book and even though I doubted there would be a happy ending for Miss Isabelle, I still held out hope almost to the very end! Its a great read! This one caught my attention as soon as I read the synopsis. I'm so glad you enjoyed it so much. Will have to keep this author in mind. Lovely job on the review. Very heartfelt.